(09-28-2010, 11:46 AM)Bill Wrote: Whoa that's really light! As for polishing the Carbon parts can't have everything huh . i agree. i find carbon components a bit boring (no offense to anyone) because i am only accustomed to polished ally. also the magnesium frame must remain painted because it rusts easily if exposed so blinging this one is completely out. I'm not a metallurgist so only thinking out loud. ? It's usually alloyed with other metals (as is aluminium) so properties can vary depending on what it is "mixed" with. Magnesium alloy can easily be corroded when touching against other metals. (galvanic action). I would think your "Magnesium" frame is actually an alloy and this will possibly allow you to "bling" it . But see if you can get anymore info', possibly from the makes. thanks for that info . thanks for that. i was only going by what i was told 'by the expert in my local pub'. however from info on the net about the Litech frame, it is 92% mg mixed with 8% other alloys which apparently remains a top secret so you are right about the mixture. do you know if this would polish up as bright as aluminium, or would it be a kind of dull grey like titanium? (09-29-2010, 07:28 PM)hcjg1 Wrote: thanks for that. i was only going by what i was told 'by the expert in my local pub'. however from info on the net about the Litech frame, it is 92% mg mixed with 8% other alloys which apparently remains a top secret so you are right about the mixture. do you know if this would polish up as bright as aluminium, or would it be a kind of dull grey like titanium? Sorry, don't know. Perhaps you could do a trial on part of the frame (under a chain stay?) and do as Bill suggests with a clear spray coating. Are "Litechs" still in business? Hi Litech went out of business but i have seen the occasional frame or bike for sale on ebay US. it looks like the magnesium frame builders go out of business after a while but there is a company called Pakeeta in the US with some really cool MG bikes. I just found another site with an independent MG frame builder who has been using an MG frame unpainted for 3 years in rain and snow with no rust issue. wherbout in the UK are you? polished these 2 sets of cranks today. no machinery used only my hands. just polished these hollowtech 2 cranks. i've found myself in a crank polishing mood. Hi hcjg1, all of these frames and parts you've stripped and polished look amazing! And you've achieved all these results without any specialist tools or machines, just your own hands and hard work? Can I ask what method you use for stripping paint from alu? Do you use a chemical stripper which you then wash off or do you get the frames media blasted or something? I'm keen to see how the mg frame turns out, how you getting along with that one? Far better to dare mighty things, to win glorious triumphs, even though checkered by failure... than to rank with those poor spirits who neither enjoy nor suffer much, because they live in a gray twilight that knows not victory nor defeat. (10-13-2010, 01:44 PM)TheButterflyCollector Wrote: Hi hcjg1, all of these frames and parts you've stripped and polished look amazing! And you've achieved all these results without any specialist tools or machines, just your own hands and hard work? Can I ask what method you use for stripping paint from alu? Do you use a chemical stripper which you then wash off or do you get the frames media blasted or something? I'm keen to see how the mg frame turns out, how you getting along with that one? hi thanks for the compliments. i swear - no tools just handwork but i am about to buy some tools otherwise i wont have any fingers left. for stripping paint i use a paint stripper named nitromoss, if the aluminum is anodized i use 80 grit emery cloth because the paint stripper doesn't remove it. 80grit emery cloth cuts through anything and it is easier to hold than sandpaper and doesn't tear up and one piece last for ages. then i use a 120 drit emery cloth or i reuse the old 80 pieces. then 300 wet sand paper no soap. then 600 wet sand paper, then 1000 wet then the finest grade steel wool with dishwashing liquid, then silve and thats the result. i am still buying parts for the MG frame. just acquired a set of KCNC brake levers. i want to make this bike as light as possible so i am selecting the right parts. i've got several projects i'm working on for people and i want to do a stand at some bike shows next year so busy polishing ally. How long did it take you from start to finish??? (10-14-2010, 02:23 AM)Canadianguy Wrote: How long did it take you from start to finish??? the more you do it the quicker you become. i used to use sandpaper but then i realized the emery cloth cuts with more ease and you can use one piece for ages so it cuts down the cost. there are areas where you could only get to by filing so i tend to file away edges and change shapes which makes it easier to sand and makes the parts like cranks end up looking really different. you need to get a square file, a round one, a flat one and a triangle. 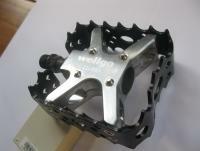 more polsihed cranks, chainwheel and KCNC brake levers. MG frame on scale. i have weighed all components just out of curiosity. all parts add up to 6298gams. 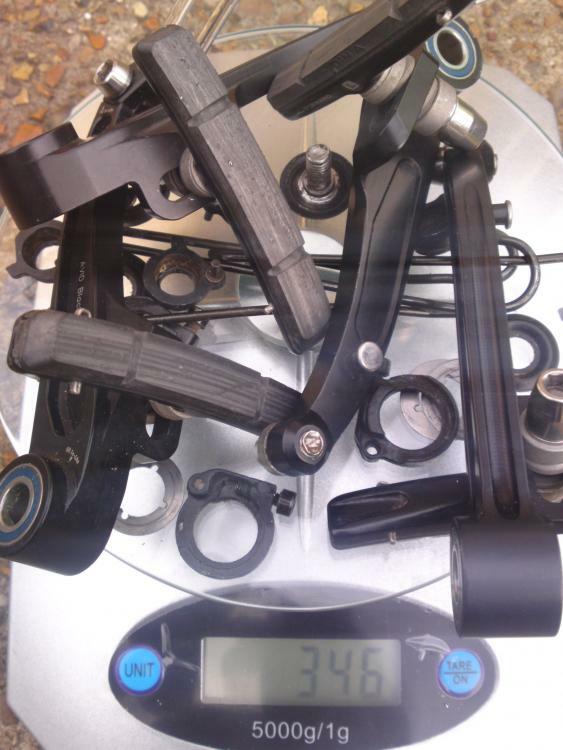 There is huge scope for reducing this by exchanging some components with more lightweight bits and experimenting by drilling out some of the parts like the crank arms but watch this space. Avid Ultimate OPS Research waiting to go on my MG frame. Polished alloy fork. Putting this on my Marin Indian Fire Trail. (10-24-2010, 06:21 PM)hcjg1 Wrote: Polished alloy fork. Putting this on my Marin Indian Fire Trail. its the new disease - polialuitis. Its an addiction to polished aluminum. It stops you from building the bikes because all the sufferer wants to do is polish aluminum components and stare at them for hours. I need rehab mate. Hehe I love the term . Again awesome job on the polish. 2 polished mtb 26 forks. one is for my MG frame (almost finished polishing the frame) and the other for my daily commuter.